Since dogs have a better sense of sound, I wonder if they could hear what this would really sound like. If those bugs were actually that size, I’m certain we would be able to tell for ourselves. We progressed about 4.5 more hours on this piece and I’m really enjoying the way it’s turning out. It’s unknown to myself if bees actually have that much goo inside them, but I feel it helps to exaggerate the brutality of this battle. Or execution. Yeah, more like an execution. 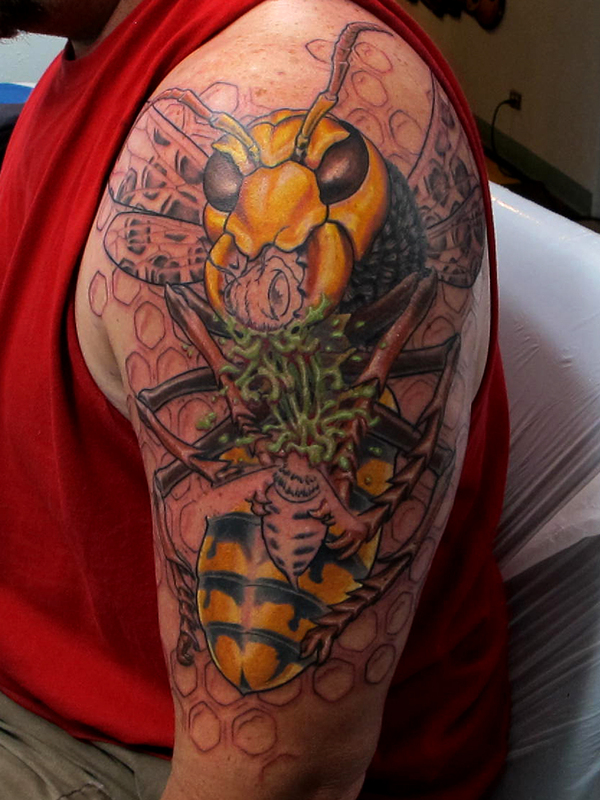 This entry was posted on April 30, 2012 at 9:26 pm and is filed under Tattoo with tags Bee, Bug, Honeycomb, Hornet. You can follow any responses to this entry through the RSS 2.0 feed. You can leave a response, or trackback from your own site.